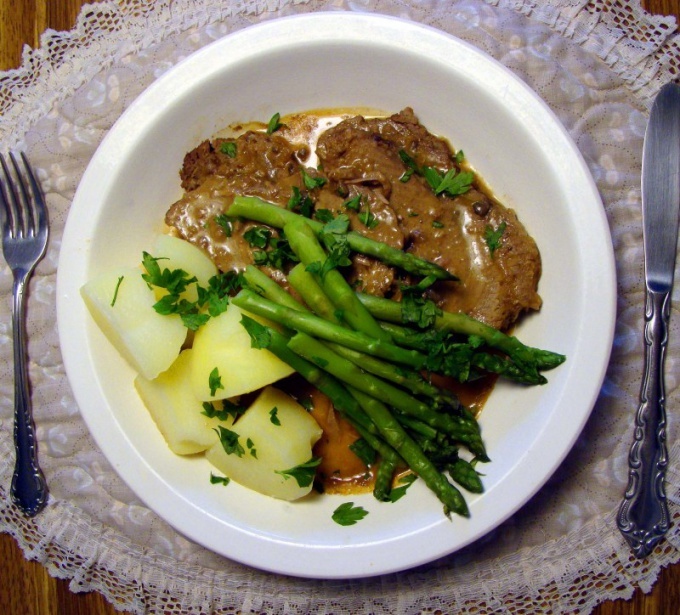 Veal dishes are juicy and tender and serve as a wonderful decoration of the festive table. The veal is perfectly digested and contains a lot of nutrients. Bake the veal in foil can be as large piece and small portions. In the store or market, select chilled meat is best for roasting a fit fillet, sirloin, Chuck or meat on the bone. Veal has a light color, also the layer of grease and film should be a light shade. Before baking the meat must marinate, because then it will be juicy, flavorful and acquire additional flavors. Marinades for veal can be based on vinegar, juices, wine, beer, dairy products and sauces. Keep in mind that you should not make the marinade too spicy because the beef itself has a special, unique taste. - salt, ground black pepper (to taste). Chilled meat free from bone, leave a certain amount of layers of fat. Make a few deep slashes, to 7-8 inches. RUB the veal with mustard and spices to taste, slit and insert the cloves of peeled garlic. Put the meat in foil for baking, salt and pepper, close it and leave for 1 hour for marinating. Preheat the oven to 250ºc and bake for 15 minutes at this temperature, then reduce to 180 ° C and continue to bake another 30 minutes. The meat is ready leave to rest in foil for 15-20 minutes. Cut meat into equal portions, place on a plate and garnish with greens to taste. Serve the veal to the table with any side dish, such as vegetables, and vegetable salads and even fruit. Veal and bacon cut into small pieces. Onions, carrots, celery root peel and shred. Tomatoes wash and cut into slices. Greens (parsley, cilantro, leeks, etc.) wash and finely shred. Connect the components together: the meat and bacon, vegetables and herbs, add salt and pepper. On the foil baking pan, place all ingredients thoroughly and pack. On the grille I put foil and bake at a temperature of 250oC for about 40-45 minutes.